Soft and comfortable, yet developed specifically to help alleviate the debilitating side-effects of diabetes, Our men’s SockShop Iomi Footnurse Diabetic Ankle Socks bring relief and protection to the foot’s vulnerable areas. Feet are cushioned by terry loop padding, and handlinked toes for smooth seams stop pressure wounds caused by rubbing, or chafing. 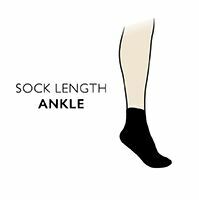 The ‘Easy Stretch’ design of SockShop Iomi Footnurse Gentle Grip Diabetic Ankle Socks is ideal for larger, or swollen legs, with an extra-wide fit that holds gently without binding or circulation constriction. A blend of fibres including cotton and Coolmax keeps feet dry and comfortably cool, while the infusion of Actifresh keeps bacteria at bay for healthier skin.